The Prince: on how many fronts can Mohammad bin Salman act simultaneously? The Saudi crown prince moves towards concentrating absolute power in his own hands, while escalating tensions on several fronts. 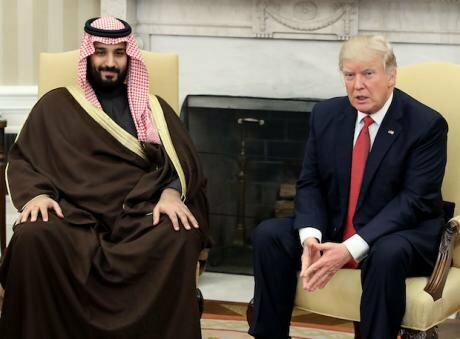 Donald Trump meets with Mohammed bin Salman in the Oval Office at the White House, March 14, 2017. Picture by Pool/ABACA/ABACA/PA Images. All rights reserved. If Machiavelli were alive today, he might have modeled his political treatise ‘The Prince’ on Saudi Crown Prince Muhammad bin Salman (MBS). Events on the first Saturday of November show that the young heir apparent is confident enough to move on several fronts at the same time on his way to what increasingly seems like concentrating absolute power in one pair of hands: his own. With the purge and detention of dozens of princes and business tycoons (some doubling both roles), as well as (former) ministers and other senior officials, MBS is doing two things: First of all, he is catering to the sentiments of the average, generally young, Saudi regarding the corrupt elites. This is a safe bet, because the population is well aware of how princes and their coteries acquired their wealth. Riskier, however, is the breaking of a long-held taboo: Publicly turning on other members of the royal family. The last time this happened openly was in 1962, when the then crown prince and later King Faisal exiled a number of firebrand young royals. Known as the ‘Free Princes’, their calls for reforms were considered too radical and dangerous for the position of the dynasty. Ironically, their ring leader is the father of one of the detained princes Al-Waleed bin Talal. In the present instance, the radical is the de facto ruler of Saudi Arabia himself. Much attention is paid to a rapid succession of changes and initiatives launched by the intrepid crown prince, presented as part of his Vision2030 for a future post-petroleum Saudi Arabia: Women will not only be allowed to drive cars, but also issue fatwas or Islamic legal opinions. Then there is the plan for a high-tech mega city in the country’s northwest – strategically located near the Red Sea on the crossroads between Asia, North Africa and the Mediterranean. Now he personally heads an anti-corruption board that already seems to have a number of high-profile cases up-and-ready. To a degree, this is all cosmetic. More important is the real-life Saudi version of Game of Thrones, consisting of a series of royal ‘musical chairs’ that started already in 2012,; three years before MBS’s father, King Salman, ascended to the throne. Since then Saudi Arabia has had five crown princes. The latest changing of the guard came only this Summer. In what was nothing short of a palace coup, MBS managed to oust his older cousin, Muhammad bin Nayef, as both crown prince and interior minister. A favourite of the political establishment in Washington, it says much of MSB’s abilities as a power player. How could an experienced political operator presiding over a massive security and intelligence apparatus be caught so off guard? The same appears to be true now. Firing and detaining dozens of very senior royals and officials takes long and careful planning, involving substantial numbers of people. How was this kept secret? Also why did the security detail of business tycoon Al-Waleed bin Talal not put up a fight? Not to mention the National Guard, until yesterday under command of Prince Miteb, the son of former King Abdullah. Once considered next in line of the throne, even after being side-lined from that, he managed to hold on to the powerbase created by his father in the 1960s and build into what is effectively a shadow army recruited from the Bedouin tribes, used to offset the regular army and security forces of the interior ministry in a careful balance of power between different branches of the royal family. It appears MBS is set on putting an end to such balances and taking absolute control of political power in Saudi Arabia. While the latest purge is presented as part of an investigation into the mismanagement of the massive floodings in the Red Sea port city of Jeddah in which more than a hundred people died, MBS is picking off influential figures from different sectors of Saudi society, targeting not only fellow royals, but also cabinet members, senior administrators, and financiers. This means that MBS can count on the loyalty of substantial numbers of people in senior enough positions within the bureaucracy, police and military to pull off such operations without equally powerful people getting wind of it. While he appears to be successful in securing his domestic powerbase, other events taking place on Saturday as well might throw a spanner into the wheels of MSB’s political machine. The surprise resignation of Lebanese Prime Minister Saad Hariri, while being in Saudi Arabia, was also more likely than not instigated by MBS as part of his rivalry with Iran for influence and power in the Middle East. The launch of a missile against Riyadh Airport by the Houthis in Yemen that same evening seems too much of a coincidence. The Houthi forces are supported by Iran in the vicious Yemen civil war, in which Saudi Arabia became meddled up when MBS became defence minister. Also the row with Qatar, which is jeopardizing the unity with the Gulf Cooperation Council (GCC) fits within that scenario. But exerting influence in international relations adds a host of variables that might be more difficult to manage than excercising domestic political control. So far MBS has managed to surprise friend and foe with his ability to outmanoeuvre and outsmart the competition, but how long will he be able to juggle an increasing number of balls at the same time?